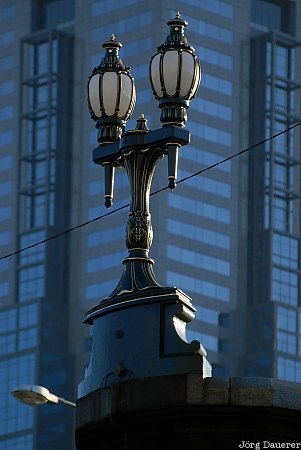 A street lamp on Princes Bridge (which crosses the Yarra River) illuminated by soft early morning light in downtown Melbourne, Victoria, Australia. This photo was taken in the morning of a sunny day in April of 2007. This photo is part of the exhibition Street Lamps (July 2008). This photo was taken with a digital camera.